The Queen, accompanied by The Duke of Edinburgh, visited Capel-le-Ferne and Canterbury Cathedral, Kent. 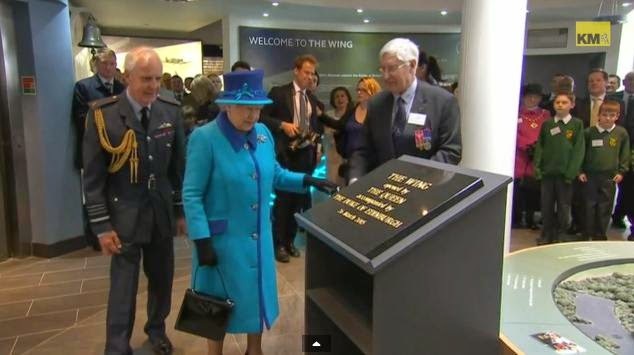 She opened a new Battle of Britain visitor center and at Canterbury Cathedral, the couple attended a service and unveiled statues of themselves created for the Diamond Jubilee. For more: BBC article, KentOnline video, Zimbio gallery. She wore one of Queen Victoria's brooches on the day the Succession to the Crown Act 2013 goes into effect, giving women an equal spot in the line of succession. It's one of her regulars anyway, obviously, but I prefer to consider it a cheeky sovereign queen high five.